Read entire label and obtain clearance from a licensed healthcare practitioner before use. This product is to be used by healthy adults only. Do not use if you have or could develop any medical condition or are taking any prescription drugs. Do not use if you are pregnant, nursing, or may become pregnant. Do not use more than the recommended dosage. Discontinue use and consult a physician if any adverse reactions occur. Keep lid tighly closed and in a cool, dry place. As with all supplements, KEEP OUT OF REACH OF CHILDREN AND ANIMALS. You can read more about each ingredient on our EAA Max blog post! If you're looking for some caffeine added to this product, see also EAA Max Energy on PricePlow! Full Essential Amino Acid Profile! Increased Performance!Full Essential Amino Acid Profile! Increased Performance! The market has been asking for a true EAA formula, no blends, just facts. BCAA's have been on the market claiming things like muscle growth for some time but truth be told a BCAA formula as great as they are, are truly used as muscular energy sources and nothing more. With a full EAA profile with the addition of the 2:1:1 BCAA's you get the ability to not only provide that muscular energy that is needed, but truly add new muscular tissue to your frame. Finally this is something we want to get across to our fans and customers; This product tastes amazing! We have been asked over and over for an amino acid product and we simply didn't want to release something that was like the rest. We didn't want a product that left a bad aftertaste that we didn't feel lived up to the standards you expect. This, to us, is by far the best tasting Amino Acid product on the market and we think you will agree. 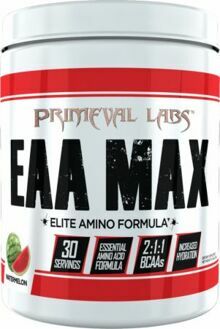 The wait is finally over, EAA MAX is here!The wait is finally over, EAA MAX is here! Cherry Lemonade This is a Buy 1 Get 1 FREE offer! Mango Pineapple This is a Buy 1 Get 1 FREE offer! Orange Sherbert This is a Buy 1 Get 1 FREE offer! Smashberry This is a Buy 1 Get 1 FREE offer! Strawberry Mango This is a Buy 1 Get 1 FREE offer! Sweet Tea This is a Buy 1 Get 1 FREE offer! Tropical Lemonade This is a Buy 1 Get 1 FREE offer!